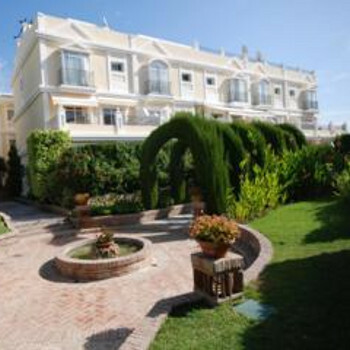 Aloha Gardens is situated on a high point less than 2km inland from the renowned Puerto Banús and 6km from Marbella. It is surrounded by many famous golf courses, Aloha Golf, La Quinta, Las Brisas, and the nearby Dama del Noche. Booked this apartment on the internet privately and although this was the first time we did this it will not be the last. The apartment complex is a gated community with good security. You will not get in unless they permit it. We stayed here in July 2002. In one word FANTASTIC. We had a two bedroom townhouse, that was genuinely a home away from home. Downstairs was the livingroom, diningroom and kitchen with all mod cons (washer/drier/dishwasher/microwave etc etc etc). Upstairs, we had a master bedroom with ensuite and balcony, which also had a spiral staircase leading to the rooftop terrace. There was a twin bedroom with another full bathroom. There are three pools (one indoor), extensive gardens, big waterfall......... I could go on. The pool on the upper level is reached through an avenue of beautifully manicured trees. This place is truly gorgeous, and I wouldn't hesitate to return. The accomodation is located beside loads of golf courses, so it is about a 5/10 minute drive into Puerto Banus, so I would say a hire car is essential. The area is mostly residential, and there weren't many holidaymakers staying here. There seem to be all different types of studios / apartments / townhouses within the complex, so I think we lucked out. There are some local shops and a couple of restaurants within walking distance. I have marked 5 points for hotel staff and entertainment, but only because there isn't a "not applicable" score. This is more of a private rental type of thing, rather than a hotel/apartment complex. I can't remember the apartment being cleaned, but they did empty your bin every day. There were plenty of towels provided, but I think they expect you to use the washer/drier and recycle. As I've said, this was a home away from home, so this was not a problem. They also provide bathrobes, but no pool towels.